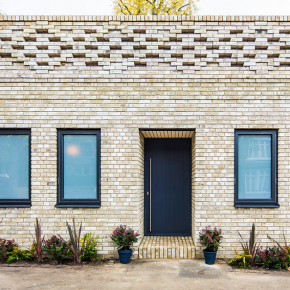 Bricks from Wienerberger have starred in the development of Nottingham Mews House, which featured on the Channel 4 show ‘Ugly House to Lovely House’. Based in The Park Estate near Nottingham Castle, Nottingham Mews House on Ogle Drive, despite sitting in a picturesque location, had a structure that was in dire need of renovation to its external facade. The original shell of the 1980’s construction was of a poor standard, having used inappropriate materials which clashed with the area’s aesthetic and Victorian heritage. The challenge faced by Chiles Evans + Care Architects was to create a more attractive aesthetic by upgrading the existing fabrics, whilst also improving energy efficiency and complementing the local vernacular. 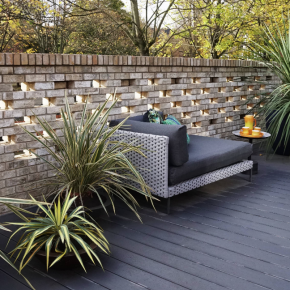 This small but challenging project was successfully achieved within the cost constraints, with architects opting for Wienerberger’s Marziale brick to replace the original external skin with a crafted brick wall that incorporates pattern, brick projection and proportion to create a new decorative facade. Marziale is a clay brick which offers a classic look, enriched by aesthetic variation in colour and texture. The product’s striking appearance creates a lasting impression, enough to stand out, but can work well with its surroundings, thanks to its neutral tones. 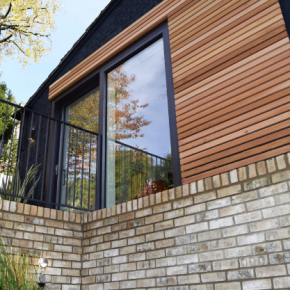 The renewal of the front facade required emphasis on aesthetic perception and energy performance. Once the external brick was removed, the inadequate state of the original construction was revealed in its entirety. The building had no insulation and the internal skin of thermalite blocks was cracked. It became clear the chosen product needed to offer durable and naturally energy efficient properties. Clay provides both of these, along with a long-life, meaning these properties will function highly for a number of generations. Naturally, clay seemed to be the best product to choose, combine this with Marziale’s look and the Wienerberger brick seemed to be the best option. “Nottingham Mews House on Ogle Drive is a truly stunning regeneration project. The architects turned what was once a bit of an eyesore into something that will leave a lasting impression to whoever sees it. “The client was looking for something that would perform efficiently when it came to energy and look great in its idyllic location which made Marziale a perfect product of choice.